This page continues the story of the High Road, Beeston, exploring the frontage between Station Road (previously Brown Lane) and Acacia Walk. Up until its closure in 1902, this area was dominated by the Silk Mill. Here, we trace its history and the story of those who lived and traded here, both in the last years of the mill operation and in its development, after the mill closure, when it evolved as a major component of Beeston's main shopping street. The closure of the silk mill in 1902 was a major turning point in the development of the section of the High Road between what was then Brown Lane (now Station Road) and Acacia Walk - as well as the area opposite on the north side - all of which was to have a major effect in establishing the High Road as Beeston's shopping street. Before that date, it was by no means that clear, Historically, the road had been part of the Nottingham to Sawley turnpike and skirted the northern limit of the ancient village core and, during the last half of the 19th century, developed as a mixture of residential properties, industry - notably the silk mill - and a smattering of shops and tradesmen's premises. Shopping was, up the time of the mill closure, more localised throughout the village and much less concentrated than what was to come. On the corner of Brown Lane stood a distinctive building with a lower profile, relative to the main mill building, and a distinctive hip roof, which still stands today, now (2012) occupied as a phone shop. This building may have been the house provided for the mill manager when the mill was operating and there are accounts of the upper room in this building being used as a meeting room for various groups during the pre-1908 period and beyond. Immediately, adjoining this was part of the main mill with five floors which stood on the line of High Road. Though dated after 1903 and after conversion to retail use on the ground floor had taken place, our photograph (right), shows clearly the overbearing bulk of the mill building when seen from the High Road. There is a slight glimpse, too, of the lower-profile corner property, already mentioned. The area to the east of this mill frontage - to the left of the photograph - was occupied by subsidiary mill buildings, probably housing boilers, with access either side and a small yard behind, in front of the bulk of further four-storey mill buildings. This is an area which, as we will see, was cleared and redeveloped by 1908 (as it had been by the time of photograph) but, in the pre-1903 era would have provided a major deterrent to the establishment of retail use on this stretch of the High Road. The next properties in the frontage were those standing either side of the entrance to Mill Yard, property that had been acquired by Samuel Watson in December 1876. To the east was one end of the cottages that occupied the yard but to the west of the entrance stood a retail shop - then numbered as 12 High Road - with living accommodation above. By 1871 it was occupied by Thomas Silman, previously a Nottingham tailor, who had - somewhat bizarrely - opened in Beeston as a marine store dealer 1. Although, by 1881 2 he had widened the scope of his business to become a broker and general dealer, by 1890 he had reverted to tailoring, working and living in two rooms within Mill Yard 3, while the shop was taken over by Misses Emma and Mary Brentnall who then traded there as drapers and milliners until about 1912. Mary and Emma were the eldest of four sisters born to John Brentnall, a Beeston framework knitter, and his wife Hannah (née Fletcher) 4. None of the sisters married and the two youngest died young - Annie, aged 20 in 1874 and Eliza as an infant in 1859 5. By 1881, Mary and Emma had begun to establish themselves as milliners and dressmakers from the family home in Wollaton Road 6 and were still there in 1889 7. In 1891, Mary was trading at the High Road premises and living there above the shop, with her parents. 8. Although Emma is not recorded there at that time, this may have been an enumeration error as she is not found elsewhere and had reappeared working and living there with her sister and father by 1901 9. Also present was a 22-year-old domestic servant, Edith Ordish, who was to stay with the sisters throughout the rest of their lives, first as their assistant in the shop and then as their companion when in retirement 10. In August 1904 John Brentnall died 11 which left the sisters with no other family to help but, by that time, they were firmly established and, now with the sure assistance of Edith Ordish 12 they continued trading. In about 1912, the sisters, with Edith Ordish, retired to live at 'Westering', Bramcote Road, Beeston where, it appears, Mary died in 1926 and Emma in 1939 and where Edith was living prior to her death in 1951 13. Next in the frontage sequence, as it approached the corner of Acacia Walk and extending round that corner, stood two saleshops that had developed out of a group of houses and a bakehouse that were acquired eventually by Samuel Watson, in April 1883 14. These properties, built at the top of what was Narrow Lane Croft, are known to have stood on this site since before 1841, as it is in that year that we can find a record of Sarah Wadsworth (b. c1796, Nottingham, née Pole) living and operating a shop there 15. By then she was the widow of William Wadsworth, a Nottingham tailor and with her at the Beeston shop were her three children; the eldest, William - aged 20, and already married for three years - was operating a bakery at the premises and soon took over completely, bringing his son Isaac into the business in due course 16. In 1865, his wife died, he remarried in 1868 and died in December 1877 17 - a sequence of events that may have triggered the sale of the property to Samuel Watson, and the bakery business itself being taken over by Arthur Gore. The son of Arthur, a tailor, and Louisa (née Rogers) Gore, he had been born in 1849 during a period of about 20 years when his parents - though both born in Nottingham - lived in the Manchester area, following their marriage at Lenton, Notts in 1834 18. They had returned to Nottingham before 1861 and, soon after this, settled in Beeston where Arthur junior found work as a baker's porter 19. In 1873, he married Ann Peel 20 and had traded as a baker in Chilwell before taking over from Wadsworth at the High Road premises in Beeston. After trading there for about twenty years, the couple had moved their business to nearby premises on Villa Street 21. It may have been significant - possibly increased rents - that the timing corresponded with acquisition by developers or it could have been an attractive offer from the next tenant - either way, what we do know is that Philip Wells Glover had taken over by 1905. Glover, only just over 30 years of age when he moved to the Beeston shop, had already had a varied career. He had trained as a confectioner with his father, Thomas Glover, who built a large confectionary business in Nottingham - first in Back Lane, then Milton Street and, by 1891 in Bridlesmith Street. There had been major set-backs; in 1879, when Philip was two, his mother died, leaving his father to continue to operate the business while caring for his five children 22. A second marriage in 1886 will certainly have helped and, by 1891, three of the children - including Philip - were old enough to assist in the business 23 but things collapsed when in 1897, his father died 24. Philip married early in the next year - to Margaret Eliza Pickup, the daughter of a Sandiacre gardener and, for the next ten years, or so, his life took a difference turn - inexplicably, the couple moved to Kegworth, Leicestershire where Philip set up as a self-employed joiner 25. By 1904, however, he had made the move to acquire the business in Beeston and was , once again, trading as a baker and confectioner 26. The occupants of the other shop in this pair, on the corner of Acacia Walk - which was apparently of similar age to the bakery - are not easily traced prior to 1871. However, it is likely that, by 1851, it was occupied by Robert Porter, an enterprising and versatile man, who appears to be trading there as a 'book seller, hairdresser and smallware dealer' 27. Within a decade, however, he had moved on to live in The City, Beeston where he first claimed to be living on income from houses and land, and then - perhaps with some wit - described himself as a 'retired jack-of-all-trades' 28. After Porter left the shop, it was taken over by Henry Wood, originally from Stanton-by-Dale, Derbyshire, where his father was the lock-keeper, and his wife Mary Searson Wood, a farmer's daughter from Ingoldsby, Lincolnshire, who moved there after their marriage in 1854 29. Their time at the shop was, however, relatively short, as Henry died in 1866, aged only 42 30. Mary Searson Wood - a Postscript - Although Henry's life was short and perhaps sad, his widow lived on for another 51 years and, given her circumstances, seems to have had a reasonably varied life. In 1861, while she was with her husband at the shop, although childless herself, she was caring for Esther Heritage, her 10 year old niece, her widowed sister Sarah's daughter 31. This arrangement continued after her husband's death, such that, by 1871, the two of them were operating a small private school in Beeston, with pupils drawn from her wider family and from her native Ingoldsby 32. It is not clear how long this venture lasted but it probably did not continue after Esther married Samuel Skingle, a Baptist Minister, in 1873 33. Neither is it clear what happened to Mary until she reappears in 1891, working as a housekeeper to a farmer in Downton, Wiltshire 34. In 1896 Samuel Skingle became the Baptist Minister in Bishop Burton, near Beverley, Yorkshire and it seems that it was around that time that Mary moved to live with the family in The Manse there. - with Esther now providing a home for her aunt when previously the roles were reversed 36. Samuel & Esther Skingle had eight children, seven of whom survived into adulthood, Beatrice, the eldest became a Board School teacher and, in 1896, Ettie, their third daughter opened a private school soon after the family's arrival in Bishop Burton, possibly encouraged by her great-aunt Mary 36, and later became a teacher with the Education Authority 37. Mary lived out her life with her niece's family, no doubt pleased that her long-time interest in education had encouraged the later generation to play their part in that field. She died in Bishop Burton in 1917 38. By 1871, the premises were occupied by the family of Hannah Roebuck, then a widow, her daughters Sarah, Hannah and Louisa and her son John, a machine builder 39 . At this stage, the sisters were employed in a small way, as dressmakers and straw-bonnet makers, as and sometimes taking work at the silk mill. Hannah Roebuck's late husband had traded in a small way was as a coal dealer from their previous home on Chapel Street 40, from where his widow Hannah continued to trade, with her oldest son Henry, as earthenware dealers, after her husband's death in 1855 41. As we have seen, by 1871, Hannah had moved to the High Road premises with her unmarried children, leaving her married son Henry at Chapel Street. Hannah's death in 1881 42 left the four unmarried siblings together at the High Road premises and in a position to develop their skills and to build a millinery business there - despite the fact that there were already two sister partnerships operating as milliners in this area - in addition to the Brentnall just a short distance away, the Lowe sisters had a similar business in Post Office Square. Nevertheless, over the next few years, Sarah & Hannah established the business at the High Road premises where the sisters had established their business 43 and were still living there, still with their brother and sister and trading in 1901 44. Remarkably, each of the three sisters died in the first six months of that year 45. Their brother John apparently continued the millinery business for a few years. This then was the position in 1903 when the mill closed - just a few scattered shops which made little of the potential that this stretch of the High Road had to offer. Things were about to change - new shops would appear and existing shops would be taken over by a new generation of shopkeepers. As we will see, in what follows, those changes would transform the High Road. 1903 - the Mill Closes and Developers Take-Over - as we have seen elsewhere, the silk mill had been forced into liquidation by its creditors - notably by Capital & Counties Bank which sought to recover nearly £8,000 that was owing by Samuel Watson, the mill owner. On 9th May 1903, a deal was completed in which all the Watson property in Beeston - on both sides of the High Road, and including the mill itself and Watson substantial house - was acquired by a syndicate of businessmen for £15,200. This syndicate was headed by Albert Ball, later to become Sir Albert Ball, who had by that date had begun to have considerable success speculating in distressed or outdated stately homes and other similar property throughout the area. He took a 9/24 share of the syndicate with the rest being taken up by Arthur William Black (the local lace manufacturer) who took a 8/24 share, Frederick Ball (Albert's brother, a Nottingham architect) who also took a 8/24 share, William Thomas Norris (a Lenton builder) who took a 2/24 share and James Holroyd (a Nottingham estate agent) who also took a 1/24 share. No time was wasted after the deal was completed and substantial change took place, on both sides of the High Road, which were to establish that part of the High Road as an extension of Post Office Square and as the principal shopping street. Now, in a matter of a few years, this stretch of the High Road was to be transformed from being predominantly industrial to being almost entirely a shopping street. The development of the northern side will be covered when we reach that point on our journey up and down the High Road; what follows is the story of the development of the mill frontage and the rest of the section as far as Acacia Walk, on the south side of the High Road. The developers' first move was to clear the subsidiary buildings - believed to have included a boiler house, from the frontage along the end of the main mill building and to build a block of six sales shops with living accommodation there. Further along, a further block of two shops with living accommodation was built, taking in the eastern side on Mill Yard and extending to the bakery in the group of existing shops towards Acacia Walk. To complete the transformation of this stretch of the High Road to become a coherent and important shopping street, the ground floor frontage of the part of the silk mill that fronted directly onto High Road was converted for retail use, along with the low-profile building on the corner of Brown Lane (which had become known as Station Road by 1908). This photograph shows this stretch of the High Road, probably about 1907, just after the redevelopment was completed. On the left can be seen part of the block of six saleshops with living accommodation over, next is the building just before the opening into Mill Yard which was then occupied by the Brentnall sisters, the taller building that comes is the other new block of two shops and then there is glimpse of the older group of building which then housed Glover's bakery and, then until recently, Roebuck's millinery shop. The tree that appears prominently, stood in the field on the other side of Acacia Walk. Renumbering the High Road - After all these developments had taken place on the High Road, it was clear that the numbering system, that had evolved over the years, was inadequate to provide for the new properties. In response to this need, The Beeston Urban District Council, through its Surveyor, Ernest A Bush, prepared a plan, in 1908, which defines the numbering on the High Road to this day. A copy of the original plan, which may be expanded in sections, can be seen here, in a new window. The Station Road Corner Property (12 High Road) - this two storey building had been part of the silk mill complex, possibly serving as the manager's residence. Its distinctive shape differentiates it from the rest of the buildings in the complex, and it survives, essentially in its original form to this day. During the redevelopment of the silk mill property, its High Road frontage, continuing round the corner for about a third of its Station Road frontage, was made available for retail use. The remainder of the ground floor remained, for the time being in other uses and the first floor continued as a meeting room for various community groups. On the renumbering plan of 1908 (see above), it is shown as occupied by 'Wilson', a person who has not been identified, However, by 1910, it was firmly in the occupation of John West who was to trade as a clothier there as 'West & Co' for about 20 years 46. John West was in his mid to late thirties when he and his wife and their three children moved to Beeston - where they lived at 31 Chilwell Road 47. John was born in Ashton in Makerfield, Lancashire in 1872 and had what appears to be a difficult early life; his mother died when he was one and it is probable that his father, a coal miner, found bringing up his five children difficult. While his older daughters would have looked after the home, John, it seems, soon moved away to work in Rotherham as a shop assistant 48. In 1896 he married Fanny Tyack 49 and, it appears they lived for a short time in Reading, Berkshire, before being obliged to live apart while John furthered his career, working as a clothier's assistant in the Sheffield area 50. 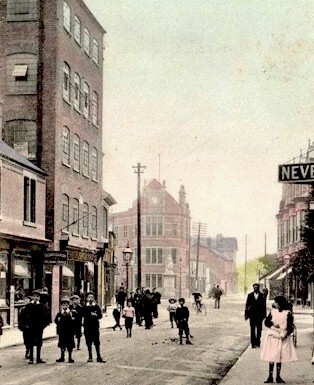 A later move to Nottingham appears to have been the prelude for the move to Beeston in about 1909. It must have been an inspired move as, just how good a trading position this was, in the heart of a fast-developing Beeston, may be seen in the image on the right. 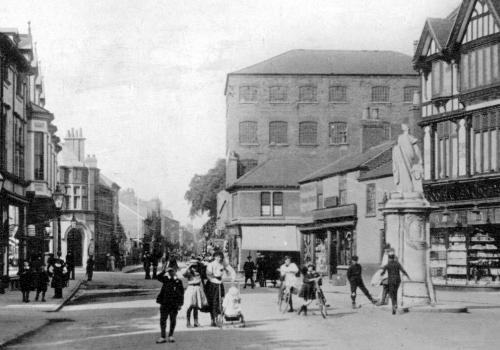 It dates from about 1910 and clearly shown, in the center of the picture and viewed from The Square, is the distinctive shape of the corner property, the High Road end of which was then newly occupied by West & Co. Towering above the shop can be seen part of the main silk mill - the ground-floor frontage of which had been converted to retail use by this time. On the other side of the High Road, the Nottingham & Notts Bank (built 1908) has opened and there is still a gap beyond it, where the Picture Palace was to be built in 1913. Around the Boer War memorial in The Square we have the distinctive mock-Tudor frontage of Boots the Chemist (opened 1908) and the old-establised business that was Doar's the grocers beyond, standing on the corner of Brown Lane, opposite West's shop. On the extreme left. there are glimpses of Commercial Buildings and London City & Midland Bank. 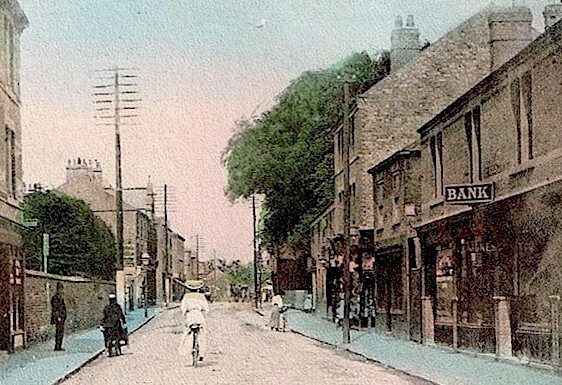 John West continued to trade at this location until 1926 when he sold the business and left Beeston with his wife, daughter Edith and son John to take over the Nags Head Inn in Heckington, Lincolnshire 51. Soon afterwards, however, his wife Fanny died 52 and Edith married Charles Sydney Scotney, the son of the saddler in Swineshead, Lincolnshire, himself a saddler there 53. John West later moved to live in a cottage in Swineshead, where he died in 1938 54. The business and site on the corner of Station Road, was taken over by Victor Oade. He was to trade there for upwards of 40 years and became one of the best known figures in Beeston life. During this time he was able to expand the business to take in the whole of the building - including the rest of its Station Road frontage and the first floor 55. Victor Hirst Oade was born in Cleckheaton, Yorkshire in 1899, the son and only child of a tailor and clothier, George Henry Oade and his wife Edith (née Hirst) 56. When Victor was just under three years old, his mother died at the very early age of 33 57. Just over two years later, George married Ada Mary Dunn, a milliner from Mansfield, Notts and moved there to live and to continue trading as a tailor and outfitter from premises at 23 Church Street, Mansfield 58. Before and after service in the Great War 59, Victor also started a career as a gentlemen's outfitter, presumably with his father before, in 1926, marrying Madge Frances Shewring, the daughter of a colliery clerk from Shirebrook, Notts 60. Following their wedding, the couple moved to Beeston where Victor had acquired John West's business as a gentlemen's outfitter. At much the same time, Madge opened a business as a ladies hairdresser at 42 High Road, Beeston 61. As well as running Beeston's premier menswear shop, Victor Oade was a well respected figure locally who served the community in many ways - not least as a local Councillor, including service as Chairman of the Council. The business became a family partnership when he was joined by his son-in-law, Adrian Le Motte. The shop became noted for its imaginative window displays which, as our picture from its later years shows, stretched the full length of its Station Road frontage. In 1968, a ladies casual-wear department was opened. Adrian Le Mottee continued to operate the business after Victor's death in 1971 and up to his own early death in 1978 62. Following this, the shop was taken over by Barry Austin, the Nottingham menswear retailer, and it continued as a quality menswear shop until being taken over as the Orange phone shop, which continues today (2012). 14-16 High Road - this pair of retail shops was created, by the developers, in the ground floor of what had been the part of the main silk mill building that fronted directly onto the High Road. At the time of the renumbering of the High Road in 1908, the shops were shown as occupied by 'Orme' and 'Laurence' respectively although, as was the case with 12 High Road, no likely local matches have been identified. However, the pair of shops were soon - certainly by 1911 - occupied by Thomas James Newbutt Meakin, as a drapers shop. Meakin had been very well established as a draper and, laterly, also as a house furnisher, in premises in The City, Beeston and now he had moved to what he saw as likely to be the centre of shopping in Beeston and made the location his main outlet for drapery. Soon after this, he was also to open cinemas in Beeston - first on Chapel Street and then the Palladium which he built on the High Road. The story of his cinema ventures and something about his life and career can be seen here. Fashioned as they were, in the ground floor of the mill and not requiring living accommodation, the shops could be made deeper than normal. In addition, the two shops became combined as one overall unit with a central deep entrance with windows on either side, forming a walk-in shop window display. This arrangement provided ideal display possibilities for the drapery business and soon became popular amongst Beeston shoppers. After Meakin's death in 1935, the business was taken over by G F Knowles Ltd and it continued through the war years and into the 1950s in much the same style as he had in Meakin's day - but, of course, with the difficulties that that era presented. The person behind this company is believed to have been George Frederick Knowles (1887-1971). We are still seeking confirmation of this and will add details in due course 63. By the 1950's self-service grocery stores began to appear on shopping streets around the country. This concept - now of course, virtually universal - was relativly late to appear, possible delayed by wide availability of specialist local shops and the dominence of Co-operative stores, where the custom of queuing at various counters within an overall shop, to be served personally by shop assistants was well entrenched. This certainly applied in Beeston which was well served by both local tradesmen and two competing Co-operative Societies - Nottingham and Long Eaton. 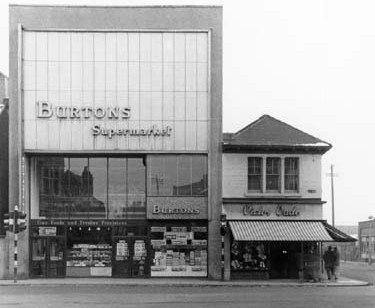 However, this began to change when, in 1957, 14-15 High Road became the site of Beeston's first self-service store - Burton's. In preparation for the opening, just in time for Christmas 1957, the whole of the building - which had until then, retained its mill-like appearance - received a make-over. It lost its hip roof and its top floor and its characteristic mill-type windows were either covered over or replaced. These changes can be seen clearly in the two photographs shown above - West's in about 1910 and Victor Oade's about 70 years later. Inside, the shop facilities were extended to include the upper floors and the High Road frontage was completely modernised to reflect the style of the time, including a large window on the first floor where a coffee shop was available for shoppers to use. The photograph on the right shows clearly the remodelled frontage of this store with the large windows on the first floor. On the right of the picture can be seen the High Road frontage of Victor Oade's shop 64. In 1963, the site was taken over by a company which had become one of the local success stories of the last decade (see left). 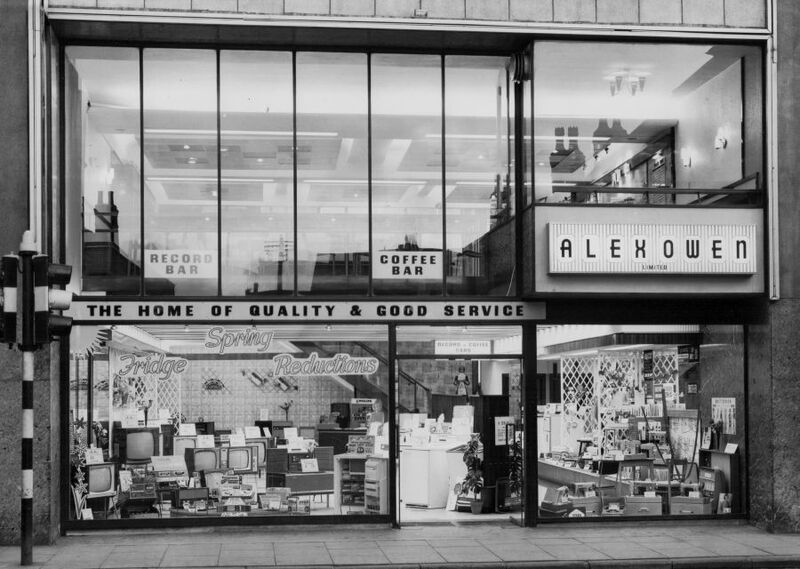 Alex Owen had started selling television sets in about 1949, from one shop at 163 High Road, Chilwell, had opened a second small shop in Beeston in time for the Coronation in 1953 and very soon found himself managing a retail empire with 500 employees and 47 shops stretching right across the Midlands. 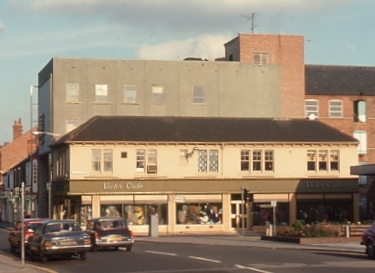 Beeston remained at the centre when he took over the building on Station Road that had been built as the Civic Restaurant to serve the needs of the immediate post-war period. The building, which still exists in a much modified form opposite what was Bostock's bacon warehouse (now the Conservative Club), served as Alex Owen's Headquarters, complete with radio mast to keep in touch with his fleet of repair and delivery vehicles. The decade from just before the Coronation had, of course, been a boom-time for selling television sets and Alex Owen - now Alex Owen Ltd - developed successfully and dramatically during these years. Well before it opened at 14-16 High Road, it had also become a major supplier of all the other domestic appliances that were now much in demand - washing machines, fridges, etc - as well as the blossoming audio market. In 1964, Alex Owen himself retired from the company, which was subsequently merged gradually into Loyds Retailers, a Philips subsidiary, eventually losing its identity in the industry. The company's presence at this location can just be glimpsed on the Victor Oade photograph above - where the distinctive 'AO' logo can just be seen - but with the red and white 'Loyds' sign also in sight. Despite its once massive presence in the local scene, the story of Alex Owen was, until recently, in danger of being forgotten. Now, with the enthusiastic support of Alex Owen's family, we have been able to record here what is currently known. We hope anyone who can add more will get in touch. These premises were occupied in the 1990s by Dixons, the electrical retailer and latterly by Clinton Cards. 18-28 High Road - this block of six shops, each with living accomodation above the shop, was built by the developers in the space previously occupied by the silk mill boiler room, immediately after they took over in 1903. 18 High Road - this was the rightmost of the six shops, separated from numbers 14/16 in the groundfloor of the main silk building (described above) by a narrow alley way. For just over two years - from the summer of 1907 to the end on 1909, this alley way led to the entrance to Beeston's first 'permanent' cinema - the 'Cozydrome' or 'Kozy Kinema', operated by Henry Peberdy in the silk mill building. Traces of the sign painted above the entrance survived for many years but the venture itself was closed by the requirements of the Cinematograph Act of 1909. A more complete account of this venture may be seen here. On the renumbering plan of 1908, number 18 was, it seems, still empty although by 1910 it is known to have been occupied by Mrs Mary Ann Elliott who was then trading there as a pork butcher 65. Mary was then the widow of Thomas Elliott who had died at the relatively young age of 52 in January 1901 66. He had worked all his life as a gardener, for many years based in Chilwell and, by the time of his death, managed to accumulate a reasonable estate - £313, the equivalent of about £27,000 in today's purchasing power 67. Her four surviving children were already of working age and all but the youngest were soon to marry and leave home 68 so it appears that Mary was prepared to use her capital to venture into a business of which she appears to have had no previous experience. She may have been encouraged - or even backed - by her late husband's family; his brother was Alfred Elliott, the respected landlord of the Royal Oak public house, whose son Alfred was already established as a butcher and was to go on to trade very successfully from a shop on the corner of Villa Street. More about the Elliott family may be seen here. In the event, Mary Ann Elliott traded here for only a few years as, by 1913, the business had been taken over by Harry Ford 69 who appears to have acquired the business on behalf of his two sons, Ernest Wilson Ford and Herbert Ford. Ernest already had experience in the butchery trade although, it seems that was not the case with his father and younger brother 70. In fact, neither son was of age when Harry took over so this probably explains why, in the early days, the shop traded in Harry's name, before changing to 'Ford & Son' and, by 1925, trading as 'E. W Ford' 71. The photograph left shows the shop in this era - with, left to right - Bill Whitman, George Harrison, William Ford and Herbert Ford 72. At this stage and probably for many years, both brothers were involved at this address but, in 1945, Herbert acquired premises at 39 Chilwell Road and took over the butcher's business which had been operated there for many years by William Wright. He was to trade at the Chilwell Road address for nearly twenty years, until 1964 when the business and property were sold to Alfred Richard Elliott (see more here). Ernest Wilson Ford continued trading at 18 High Road until his death at the end'+ ' of 1954 73. The business was then sold to T N Parr Limited, a local pork pie manufacturer which eventually merged with Pork Farms Ltd. The shop is now (2012) occupied by a branch of Greggs, the national bakery chain. 20 High Road - this property was occupied by the time of the renumbering in 1908 by Thomas Mason Lloyd who with his wife, Edith Ruth Lloyd, operated there as a confectioner and tobacconist. The couple originated from Essex where Thomas' father, also Thomas, had run a business as a miller and machinist 74. The young Thomas, born in 1862 75, followed his father as a miller's engineer, first in Essex where he married Edith Ruth Carden in 1887 76, and later, before 1901, in Warwickshire 77. Edith was nearly 50 when the couple and their only child, Eva Blanche Edith Lloyd (1889-1970), moved to Beeston. With no obvious previous experience in the trade, the decision to open a sweet and tobacco shop appears to have been a typical later-in-life fulfillment of a life-time dream for Edith, who operated the shop while Thomas held down an engineering job in Sheffield 78. It certainly seems to have been successful as the couple remained there for over 30 years, probably up to Thomas' death in 1944 79. It appears that the shop was then taken over by a company named 'Marshalls' 80 but eventually, like many other local businesses, it was replaced by a national name and is now (2012) the site of a branch of the bookmaker, William Hill. 22 High Road - by 1910, this shop had opened as a newsagent by Gertrude Wharton (née Belton), the widow of Ralph Robert Wharton. The couple had previously operated a similar business at 6 High Road, in The Square. As we saw then, Ralph's death in 1907 was probably the trigger for Gertrude's move from the Square 81. In the event, she stayed here for only a few years as, by 1913, the business had been taken over by a Mrs Annie E Tucker and, by 1920, by Arthur Wilkinson, neither of whom can be otherwise identified with any certainty 82. In 1925, the newsagency is known to have been operated by Walter Bostock 83. By about 1932, however, the business was operated by William Herbert Smith (who traded there as 'W H Smith' but should not be confused with the national chain of newsagents of that name!) assisted by his wife Kathleen Mary (née Carver). William and Kathleen originated from nearby Long Eaton and married there in 1931 84 and moved to Beeston to take over the newsagent business. Eventually, they were to live, just around the corner at 1 Acacia Walk, treating the shop as a lock-up and renting out the living accommodation to others. This shop and its occupants in this era are remembered particularly well by the author as he regularly visited to 'pay for the papers' which they delivered to the family home - and it would have been Mrs Smith who kindly obtained a copy of the first edition of 'The Eagle' for him, when it became an overnight success in April, 1950. William Smith died in 1957 at the relatively young age of 51 and it seems that his widow then sold the business as, by about 1960, it was known as 'Frank's Newsagents' 85. By about 1960, the shop was occupied as 'Frank's Newsagency' 86. More recently it was occupied by Horspools Bakery and is now (2012) Upper Crust Bakery, specialising in wedding and birthday cakes. 24 High Road - the first occupant of this shop was William Jones who was trading there by 1908 as a greengrocer and fruiterer, having previously been at 17 High Road 87. William was born in Nuneaton, Warwickshire in 1840 88, the son of Richard Jones, a labourer, turned maltster, and Jane his wife 89. Jane died when William was aged eight 90 and Richard appears to have remained a widower, alone with William who, in time, started work there as a ribbon weaver 91 - a trade that had then dominated Nuneaton, Coventry and the surrounding communities for about 150 years. However, William had started in the trade just at the point that its survival was under threat from cheap imports and technological change. It seems, William responded by moving to Beeston where he was able to find work as a throwster at the silk mill and where, in 1877, he married Ann Martin and settled in Chapel Street 92. Their son, Urban Percival Jones - an only child - was born in Mapperley, Nottingham in 1884 93. Why they had moved there from Beeston is not understood but, as they appeared back in Beeston by 1891, trading as a greengrocer - later described as a fruiterer - at 17 High Road 94, we can perhaps surmise that he had, in the meantime, learnt the trade. As we have seen, he continued trading there until the move to 24 High Road in about 1905. Although the shop had its own living accommodation, the couple chose to live at 13 Wilkinson Avenue, Beeston. Urban, their son, who had worked at Beeston Foundry (later Beeston Boiler Company) as a clerk, from when he left school in 1897, stayed at home until he married, towards the end of 1911 95, a time which appears to coincide with William retirement from his business. William died in 1921, just a few months after the death of his wife Ann 96. 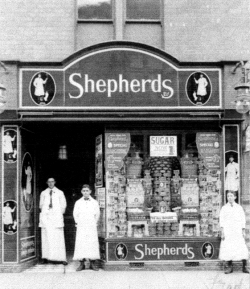 The next occupant of this shop was Shepherds Diaries Ltd, one of several national grocery chains that had begun to appear on high streets throughout Britain around that time. Up until then, Beeston shops had been almost exclusively owned and run by individual tradesman but now we began to see the arrival of national brands; this was something new to Beeston High Road and Shepherds was amongst the first 97. 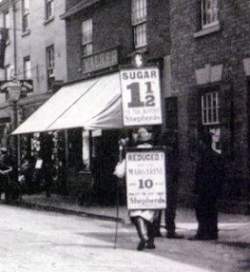 The company used its name to the full when promoting its brand and in local advertising - Beeston shoppers soon got used to seeing a sandwich board man, dressed as a shepherd, walking the High Road, promoting enticing offers at the shop (see left - where he has also managed to get in the picture when the postcard photographer visited). By about 1930, the shop had been taken over (as had the Shepherd chain as a whole) by an even more famous high street name - Home & Colonial 98, which had its origins as a single shop in Edgware Road, London in 1883. Its owner, Julius Drewe, soon began to expand nationally by opening stores specialising in selling tea. By 1903 there were 500 stores countrywide but an even bigger expansion took place between 1924 and 1931 when a series of mergers - including, in 1929, the Liptons stores - brought the number of branches nationally to 3000. It was during this period of expansion that the Beeston store came under the Home & Colonial management and brand. This type of store catered for the needs of the shopper - almost invariably the housewife - of that era, who expected and valued personal, counter service and the keen prices that the multiples were able to offer. Home & Colonial continued in that role in Beeston, at this location, for over 30 more years until the arrival of self-service and the renaming and take-over of the company nationally, meant it's eventual disappearance in the 1960s 99. Today (2012), this shop is the location for a branch of Robert Innes, the estate agent. 26 High Road - at the time of the 1908 renumbering and when our main picture (above) was taken, this shop was occupied as a bank - as can clearly be seen by the wooden, v-shaped sign above the door.Although no documentary evidence has been found, its is likely that it was being used as a temporary location for the Beeston branch of the Nottingham & Nottinghamshire Banking Company while its purpose built branch - now NatWest Bank - was being built across the road, on the corner of Wollaton Road. This new home was completed in 1908, following which 26 High Road became a butcher's shop, part of a national chain trading as James Nelson & Sons Ltd 100. Its founder had started, in the 1880s, by importing cattle into Liverpool from his native Ireland. This invaluable shipping experience encouraging him to develop a trade in cheap frozen beef which he brought in from Argentina in his own fleet of ships. 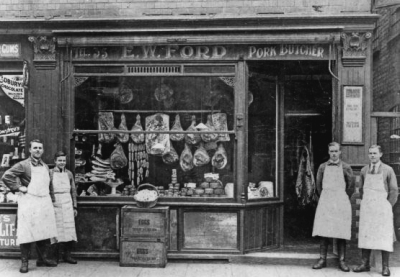 This meat was sold in Britain through a chain of shops - eventually totally 1700, of which this shop in Beeston was one. In 1914, Nelsons joined with the 500 shop chain of River Plate Fresh Meat Company to form a rationalised chain of 1200 shops which traded, in Beeston and throughout the chain, as British & Argentine Meat Co Ltd 101. In 1923, the chain was taken over by Union Cold Storage Company, a company founded and owned by the Vestey family which had developed a similar business bringing frozen beef to the British market. At that point, the Beeston shop was rebranded to trade as a Vestey company, J H Dewhurst Ltd 102, and continued to trade at this location until relatively recent times. Nationally, the chain was disbanded in 1995 in the face of increasing competition from the large supermarkets. A branch of Max Spielmann, the photo printing specialists, currently (2012) occupies this shop. 28 High Road - On the renumbering plan of 1908, this address is shown as occupied by 'Leaman' who remains unidentified. By 1910, however, it was occupied by Albert James Ablett who was to trade on the High Road, selling shoes, for about 35 years. Ablett was born in Wimblingdon 103, a small village near March in Cambridgeshire, the son of Joseph Ablett, a Wesleyan lay preacher who, doubtless following the 'self-help' Methodist ideal, managed to progress from farm labourer, to general dealer and boot maker to become an agent for the Refuge Assurance Company 104. Along the way, however, he faced the tragedy of the death of Eliza, his first wife - Albert's mother - at the early age of 33 105 - but, with a young family of five to care for, he quickly remarried - to Fanny Christmas, a nurse at Addenbrookes Hospital in Cambridge 106. When it was time for Albert to leave school, he found work in the shoe trade, including working for a shoe shop in the Putney area of south-west London 107. Soon after 1901, the family moved to Bulwell, Nottingham, perhaps following an opportunity to get another agency with Refuge Assurance. Albert came to Bulwell with the family 109 and it wasn't very long before he made two moves of his own which were to determine the direction of the rest of his life - by 1910 he had opened his own shoe shop at 28 High Road, Beeston 110 and then, in 1911, he married Ada Eliza Stevenson 111 and, having previously lived with his family in Bulwell, the couple made their home in Beeston. In 1913, Ablett moved to larger premises, next door at number 30 - where we will continue their story - and no 28 was taken over by Frederick Newbold, a baker and confectioner. Frederick Newbold was born in Lincoln in 1865, the son of John Davison Newbold & Ann (née Gadsby), his wife 112. John kept a marine store in St Benedict's Square, in the heart of Lincoln, with the help, over the years, from members of his large family - although, when Frederick he worked for a time as an ironmonger 113. Frederick had been only 12 when in 1876, his mother, Ann Newbold had died aged 47 114 and, with a large family to care for and a business to run, it is perhaps not surprising that, within a year, he married Eliza, the widow of Charles Downs, a Lincoln stone mason 115. It seems also that a close connection had developed with the family of John & Mary Ann (née Hawson) Darcey, both of which had been born in Lincoln 116 but had moved to Manchester for a time in the early days of their marriage and it was there that their three children had been born between 1867 and 1871 117. During that time, John Darcey had worked as a builder and continued in this occupation after the family returned to Lincoln sometime prior to 1881 118. They then lived at 120 Newland Street West, within a short walking distance of the Newbold family home. Whatever the depth of the friendship between the families was generally, Frederick Newbold and his brother Christopher certainly became close to two Darcey daughters, Lucy Jeanie and Annie Elizabeth Darcey respectively, and began to think of marriage. However, it was at this point that the girls' father made the somewhat remarkable decision to change the direction of his career to move to Nottingham to become a confectioner, a change that was to be particularly significant for Frederick who made the same changes of direction. So it was that, by 1891, the Darceys were established in a confectionery business at 178 Peveril Street, Nottingham 119 and Frederick had also working as a confectioner in Nottingham 120, in all probability for the Darceys' business. Later in 1891, the relationship between the two families was complete when, in a double ceremony, the Newbold brothers married the Darcey sisters - Frederick married Lucy Jeanie and Christopher married Annie Elizabeth 121. Within the next ten years, Frederick & Lucy had established themselves in their own confectionery business at 128/130 Alfreton Road, Nottingham 122 and, by 1906, had moved to Beeston, first trading at 56 High Road 123 before taking over the shop at 28 High Road when it was vacated by Albert Ablett in 1913. The Newbolds, including sons Frederick and Christopher, were to trade at this location for about 40 years and also opened a branch at 53 Chilwell Road 124. When Frederick died in January 1940 125, his widow Lucy was already in her 70s but continued to serve in the shop for at least another 10 years 126. The writer remembers being sent to the shop by his mother on several occasions to buy 'a ha'peth of yeast' 127 and being served by a very old lady - presumably Lucy - who always insisted that he had to bring his own wrapping paper! In the late 1950s, the shop was taken over by Frederick Jacques 128 as a wallpaper and paint shop, where he was assisted by his wife Margaret Maud 129, having previously had a shop elsewhere at 105 High Road, since the mid-1930s 130. In about 2008, 28 High Road was demolished and its site combined with the existing alley at its side to form a pedestrian entrance to the Tesco development. 30 High Road - this comprises the detached property, once numbered 12 High Road, already described as predating the 1903 takeover, that once stood at the entrance to Mill Yard. As already described above, it was then occupied by the Brentnall sisters who, assisted by Edith Ordish, operated there as Milliners and dressmakers. This continued until their retirement in about 1912. At about this time, certainly by 1913, the premises became occupied as a shoe shop, by Albert James Ablett 133, he having moved from smaller premises, next door at 28 High Road. Ablett's shoe shop continued at this address for over 30 years, apparently up to Albert's death in 1946, serving generations of Beeston families 134. The next occupant became equally well known in Beeston - and, in fact, had such a similar background that it is hard not to wonder whether there was some connection. Albert James Pounder was born in Bulwell, Notts, where Ablett had lived and worked, and both their families were involved in the shoe trade - but, for now, we have to put the possibility of a close connection aside and look at the Pounder family seperately. Albert James Pounder was born in 1907, the son of Albert William and Florence Elizabeth Pounder 135. Several generations of the Pounder family had worked as shoemakers but Albert senior, like others of the era, had recognised the trend away from dependance on local craftsman to concentrate on the trend towards shoe retailing. Following his marriage, in 1902, to Florence Elizabeth Beeson 136, he had started trading from a shop in Bulwell. His son Albert joined him in the business after leaving school and together, trading as 'Albert W Pounder & Son', they developed a network of shops around Nottingham and into Leicestershire and Derbyshire. 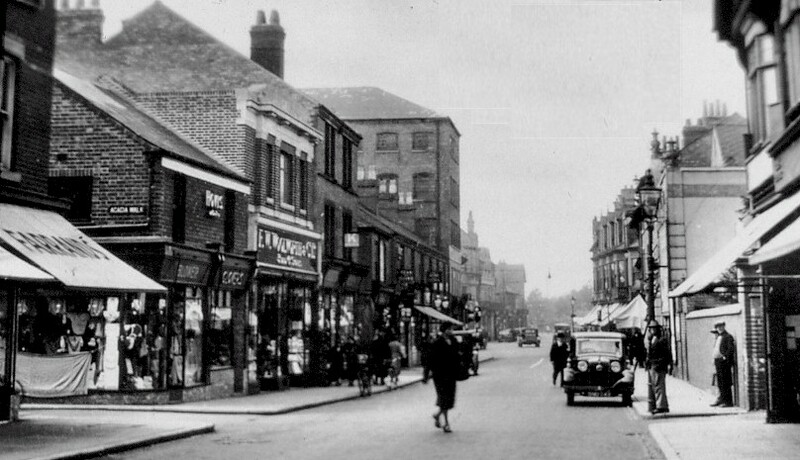 The firm first opened in Beeston in October 1934 - at 118 High Road. Its advertisement in the local paper proclaiming 'Pounders have come to Beeston' 137 showed how well known it was in the Nottingham area. And, in the late 1940's, the firm also took over at 30 High Road, following the death of Albert Ablett, and developed the site to include its company headquarters and central warehouse, alongside the large shop - now, with the shop at number 118 continuing, its second in Beeston. By the late 1950s, these headquarters controlled a network of 25 shops, with Albert James Pounder as its Chairman and Managing Director 138. Later in their life, Albert William Pounder and his wife came to live in Elm Avenue, Beeston 139 and his son Albert James Pounder settled on Derby Road, Bramcote at the time the Beeston headquarters were established. Described as a man of courage, determination and dignity, he was a sportsman - playing cricket until he was over 50 - a Director of Notts County Football Club, served as a Magistrate and became particularly active in local government politics. In 1955, he was elected to the County Council, as a Conservative, for Chilwell and continued to hold the ward until his death in January 1968. In April of the previous year, he had become the Chairman of Nottinghamshire County Council 140. A school at Chilwell was named in his memory. Mill Yard - Between numbers 30 and 32 High Road, was the entrance to Mill Yard containing six residential cottages which pre-dated the 1841 census, had been acquired by Watson in 1876 and taken over by the developers who acquired the whole of the silk mill site in 1903. Some if not all of properties continued to be occupied into the 1930s but were eventually demolished as no longer suitable for modern occupation. The yard also provided access to the rear of 36 High Road where there was a number of cottages - probably two - which were demolished when the Woolworth store was built in 1934 141 (see below). Later, as is visible in the photograph (below right), warehousing was built in the yard, possibly by Albert Pounder. The entrance to the yard is now incorporated in the pedestrian entrance to the Tesco development and any remaining buildings, associated with the yard, have been cleared. 32 High Road - this property was one of a pair of shops, with living accommodation on two upper stories, which had been built soon after the take-over of the silk mill site by developers in 1903. By 1908, probably a year or two before, the premises were occupied by Arthur Paling and his wife Sarah Ann. While Arthur had other employment, his wife operated there as a furniture and general dealer with the help of her cousin, Ethel Lingard 142. Arthur Paling was a son, one of about eight children born to Robert and Rebecca (née Allen. Born in Grimstom, Leicestershire in 1842 143. Robert Paling first followed his father to work on a farm before joining the railway. He and his wife Rebecca, whom he married in 1864, had moved to Nottingham by 1866 and then, by about 1877, had moved to Beeston 144. By this date he had gained a supervisory role with the railway and became traffic foreman for the area. His son Arthur, born in Nottingham in 1875, became apprenticed as a painter and continued to work in that trade in the first years of his marriage to Sarah Ann Walker in 1896 145. Sarah Ann was the daughter of Samuel and Sarah Ann (née Lingard) Walker, who had moved from Sheffield towards the end of the 1870s and to Beeston in about 1890. Having worked as a table blade forger in Sheffield and as a labourer in Nottingham, he appears to have moved to Beeston to work at Beeston Foundry while his daughter Sarah Ann, found work as a machine knitter 146. By 1901, both Arthur and Sarah Ann - by now married to Arthur Paling - had become shopkeepers in Beeston. Samuel Walker was trading in groceries at 74 Wollaton Road while Sarah Ann Paling had a shop at 37 Middle Street 147. At that time too, Samuel and Sarah Ann Walker had taken in Ethel Lingard, then the eleven year old orphaned daughter of Sarah Ann's late brother Robert 148. By 1904, Arthur Paling is recorded as trading as a general dealer at 121 High Road 149 although it was probably his wife who kept the shop, an arrangement which appears to have continued during their time at 32 High Road. With no children of their own, it was perhaps to be expected that Ethel Lingard had moved to live and work at the shop by 1911. By the early 1930s, the premises and business had been taken over by Arthur Ernest Eite. Born in Nottingham in 1888, Eite was the son of William Henry and Elizabeth (née Darbyshire ) Eite. William Henry was carpenter and joiner, the son of a carpenter, and had - somewhat strangely - been born in New York in about 1860, in the early years of his parents' marriage 150. Towards the end of his career, by 1912 when he would have been aged about 52, William Henry seems to have changed direction to become a general dealer - presumably selling furniture and general hardware items - at 190 Carlton Road, Nottingham 151. His son Arthur had worked initially as a lace warehouseman but after his marriage to Sarah Elizabeth King in 1912 152, and despite a disability that limited his ability to walk distances, he started work at Gedling Colliery. This was the position when, during the Great War and following enlistment in June 1916, he joined the Army Service Corps in March 1917. After being posted to Grove Park, a former workhouse in south-east London that had been taken over by the ASC, where he was to receive driver training, he was discharged to the Reserve as unfit after only 3 months, and required to return to Gedling Colliery 153. Eventually, it seems, he was able to join his father as a general dealer, moving to run his own business at Beeston, with his wife and their daughter, Edna Gertrude, when Paling's business became available. In the early 1950s, probably a few years before Arthur Eite died in 1956, the premises, together with number 34, were taken over by Timpsons shoes. Timpsons has it origins in 1865, when it was founded in Manchester, as a shoe retailer, by William Timpson and his brother-in-law Walter Joyce 154. The company grew, steadily at first, and much more rapidly, under the direction of the next generation of the family, in the decade before the Second World War. By then, the number of shops was approaching 200, which were supported by a large shoe factory and a network of repair factories. Expansion of the branch network continued after the War - indeed, it was during this time that the Beeston shop was opened - such that Timpsons became the shoe shop of choice for many people throughout the northern part of England and in Scotland. 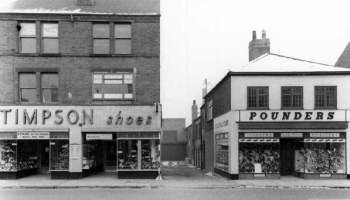 In the 1960s, the shoe trade saw increasing competition from the British Shoe Corporation which, under Charles Clore, had acquired a number of High Street shoe chains - a situation which Timpson took on by a programme of improvement and even additional shops. Changes in the shoe market, however, continued apace; large national department stores offered cheap shoes and fashion changes were a continual challenge and after upheavals in the Board, the company was sold to United Drapery Stores in 1973. John Timpson, the son of Anthony Timpson, the then Chairman, had graduated from Nottingham University in the 1960s - so, coincidently, it is highly likely that he was very familiar with the Beeston shop - and soon joined the Company and had been appointed Director responsible for buying by the time of the Board shake-up. Soon after this, the company was sold to United Drapery Stores. John stayed with the new ownership and, a few years later, became Managing Director of the former family business. In 1983 he led a management buyout of the Company. After a programme of rationalisation, which saw the shoe shops sold to George Oliver, a rival retailer, the business was refocused on shoe repairing and key cutting and subsequently made a series of acquisitions to diversify into engraving, watch repairs, dry cleaning and photo processing. Today, the firm, now wholly owned by the family again, has 800 shops that are well-known and recognised nationwide. Although today, this new style Timpson retains a presence on the High Road, it is now located further along at 42 High Road. The original site, at 32-34 High Road, is now a branch of Nottingham Building Society Estate Agents. 34 High Road - this was the other half (with 32 High Road) of a pair of shops, built soon after the sale of the silk mill property in 1903. It comprised a sales shop with two floors above which were intended as living accommodation but may also have been used in part as storage space at various times. Essentially from the start, the property was occupied by the firm of Samuel Smith as a shoe shop, and run for them by a succession of managers who lived 'over the shop' with their respective families 155. The firm was named for Samuel Smith who was born in Nottingham, about 1823, who with his brother Edward, developed their family boot and shoe making business, including the shoe shop - or 'shoe booth' as it was known - an imposing building, prominently situated on Exchange Row, on the corner of Bridlesmith Gate, opposite Victoria Street in central Nottingham - the classic Victorian entrepreneurial development of a traditional craft 156. Edward had died in 1873 so that, by 1881 157, Samuel was operating the business with his sons Thomas, Edward and Henry with a younger son, Albert, joining in due course. Samuel died in 1891, his son Henry in 1893 and son Edward in 1898 158. Thomas and Albert continued to run the business until their respective deaths in 1920 and 1921 159 and the branch in Beeston is known to have continued for some time after this. It seems likely that what remained of the business, including the Beeston shop, was sold to Timpsons who, then or later, took over the adjoining shop to for a combined shop - albeit, as we can see from the photograph, above right, with two entrances. 36 High Road - as we have already seen, by 1904, just after the 1903 transition. this property became occupied by Philip Wells Glover, a baker and confectioner who, after taking a few years out from his trade, was now keen to establish himself in business. In the event, he was to trade there for about 30 years - although during that time, in 1917, he had to face his wife Margaret's death, aged only 42, leaving three children, then aged about 18, 14 and 5 respectively. Less that a year later however, Philip married his wife's brother's widow Heloise Ethel Pickup (née Rowell) who, herself, had been widowed earlier in the previous year 160. In business terms though, it seems that his confidence in making the move to Beeston was rewarded as his business prospered. As we will see when we take a look at the development of the next section of the High Road - between Acacia Walk and Union Street - by the 1920s he had become established and confident enough to carry out substantial new shop developments. Already, by this time, Glover and his family had lived at an attractive home, below the High Road, at 39 Union Street but, in the 1920s, he built and moved to The Lilacs, a substantial family home on Acacia Walk - now, of course, demolished and redeveloped as a sheltered housing complex with the same name. Aspects of the family's home life at each of these homes may be seen by clicking here. The story of Woolworths is well documented 161. Founded in America by Frank Winfield Woolworth, who pioneered the 'Five & Ten Cent' store formula, it became extremely successful and popular. His policy of tracking products 'back to the source' and buying directly, often brought him to the United Kingdom and, seeing the potential, despite reservation from colleagues, the company opened its first store outside North America in Liverpool in 1909 and invested $50,000 to launch the British chain of 'Threepence and Sixpence' stores. More soon followed and the phenominal growth that followed was financed entirely out of earnings. Almost from the start, the British company was managed by William Lawrence Stephenson, a Yorkshireman whom Woolworth had met and been impressed with on a buying trip. By the time Beeston was in line for a Woolworth store, the company was opening a store every five days in Britain and had just opened its 600th store there. This phenomenal rate of expansion was largely achieved by using the company's own workforce, who worked around the clock, moving quickly from one job to another. The building programme was under the direction of B C Donaldson who delivered a standard model of store - in terms of frontage, windows and interior fittings - all features which became very familiar to shoppers throughout the country. By 1934, when the F W Woolworth Company was looking to bring its successful retailing formula to Beeston, it was part of Glover's site on the High Road that they chose. The store opened there on 12th October 1934 162. This Beeston store - which can be see in the mid-1930s street scene, above right - had all the standard features, including red-brick frontage and distinctive roof-level parapet that had appeared in towns throught Britain. Glover, however, retained the freehold. As can be seen in the photograph, Glover's confectionery business continued for a while in a reduced frontage, alongside the original store but after a few years - probably about 1939, shortly before his sudden death in May 1940 163 - the Woolworth frontage was extended to take in what had been his remaining shop, to the left, leaving only Blower's shop between it and Acacia Walk. His wife continued to live at The Lilacs until her death in 1954 164. The Woolworth store at this location was to maintain its 1930s appearance for more than 30 years and many still remember its mahogany counters with stock that was moved around regularly to encourage shoppers to look around to find what they wanted - and maybe buy other items. Eventually, a management buyout of Woolworths in Britain in 1982 brought change, both to the appearance of the store - with a new frontage and remodelled interior and changes to the range of goods and their presentation. However, as part of further rationisation in the store was closed on 27 February 1988 165, having been part of the Beeston street scene for over 53 years. The site was then occupied partly by a branch of Superdrug and the remainder by a branch of the shoe retailers, Jonathan James. 38 High Road - this property, part of a group of older buildings that had stood on the corner of Acacia Walk for many years, continued to be occupied by John Roebuck for a few years after the 1903 transition. Soon though, it was taken over by a man who was to become a memorable part of the High Road scene for over 40 years - Joe Blower. Joseph Edwin Blower was born in Nottingham in 1887, one of eleven children of Moulson & Jane Elizabeth Blower 166. 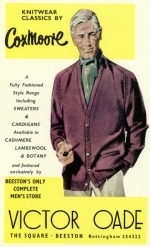 Moulson, born in 1845, originated from Chester where he had started in the retail drapery trade as an apprentice before moving to Nottingham where, by 1881, he opened his own outfitters shop at 45 Heskey Street 167. In the meantime, in 1876, he had married Jane Elizabeth Coates, the daughter of a Nottingham rope manufacturer 168. Joseph became an assistant, alongside several of his brothers, in his father's shops - which, by that time, were on Queen's Street and at 48 Pelham Street, Nottingham 169. However, things appear to have changed abruptly after Moulson's wife Jane in 1905 170, such that by 1911, Joseph was working as a lace warehouseman, living with his widowed father at 7 Humber Road, Beeston 171. His daughter Ruth Lillian Blower had, however, started in business as an outfitter at 38 High Road and was living there with two adult brothers and a younger brother who was still at school. By the following year, Ruth had married and her brother Joseph had taken possesion of the shop 172. A few years later, came the upheaval and tragedy of the Great War. Joseph served from June 1916 and had been forced to leave the business in the care of his assistant, Mabel Strutt who, with some difficulty, managed to keep things going 173. Joseph and Mabel were married just prior to Joe's release from the Army in April 1919 174 and, happily, they were able to concentrate on the business again and their life together. A daughter and son were born during the next three years. Joe died in January 1964, followed by his wife, just over four years later 175. The late Hetley Towlson was to sum up his memories of Joe and his drapery business as follows 176 - '..thousands of buttons were in stock. He seemed to know where everything was, dashing about to give a spendid service, almost bowing and scraping in his eagerness to please, but a very nice man'. Like many others in Beeston, particularly boys of all ages, Hetley also recalled that Blowers was also the place to go to buy Dinky toys and Meccano. The author remembers vividly, the display in a little side window on Acacia Walk. By about 1960, the shop was occupied by Helen Bartle 177, then, for perhaps 40 years, by Birds, The Confectioners and now by Robert Ellis, the estate agency. This completes the story of the stretch of the High Road between Station Road and Acacia Walk and the life and times of those who were connected with them. We have seen it develop from an essentially industrial scene to a shopping street, first characterised by small tradesman, often embarking in business for the first time with little or no family tradition of shopkeeping. Then we saw that pattern begin to change by the arrival of Woolworths and, in the last thirty years, an almost complete transition, with national and regional corporate businesses dominating the street scene, With shopping streets showing the strain almost everywhere, this stretch of the High Road has perhaps done better than most.